In my quest for recipes using Chestnuts from the Sweet Chestnut tree, I came across this Chestnut and Butternut Squash recipe from the Good Food magazine. It ticks all the boxes, as far as I’m concerned, as I’m researching and stockpiling as many recipes as I can for when my Sweet Chestnut tree hopefully produces masses of those sweet nuts. OK, I know it could be a long wait, as I haven’t yet planted one! But I can practice using Merchant Gourmet packaged or tinned ones, or even fresh ones from the superb greengrocer’s shop in Hornsea. 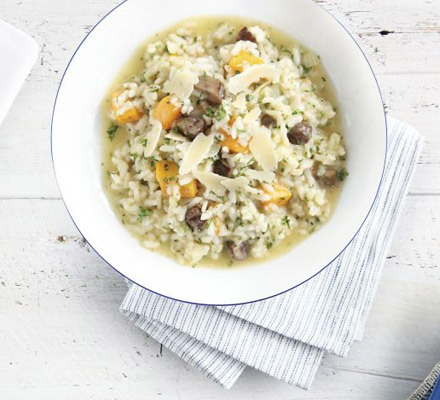 The recipe sounds like a perfect meal for Erik and myself – full of soft but crunchy sweet chestnuts, chunks of soft orange butternut squash, the gentle tang of sage, parmesan cheese and soft, tender risotto rice, filled with all the stock aromas and stirred with love until creamy perfect. I really love making Risotto. This Chestnut & Butternut Squash Recipe will be a welcome addition to my repertoire. I've just made this dish and realised that the Butternut Squash needed to be partially cooked before adding to the risotto mix, so I've added that into the Instructions.The Italians believe that it is very important to add the liquid in batches, and that the love you have for your family and friends is shown by the patience you have in gently stirring and adding and tasting your risotto. I really do find it a soothing experience, and obviously the finished produce, made with love, tastes superb (and very yummy as well). 4 tbsp freshly grated parmesan (or vegetarian alternative) plus extra to serve. Half fill a medium pan with water and bring to the boil - add pieces of squash and cook for 5 minutes. Meanwhile, heat oil in a large pan. Add the onion and garlic and cook gently for 5 mins until the onion is soft and pale gold. Drain the squash well then add the squash, sage and rice to the onion mix and cook for a further 2 mins. Pour in about a third of the hot stock, and stir regularly until the rice has absorbed almost all of the liquid. Add another third of stock, and stir again until most of the liquid is absorbed, then add the chestnuts and the last third of the stock, and stir gently until the rice is tender and the stock has been absorbed. Take off the heat. Stir in the butter, and parmesan cheese. Put the lid on the pan and leave for 5 minutes. Dish up into big bowls, and scatter with the extra parmesan cheese and the chopped parley, season and serve. Enjoy. Refreshed, Revamped, Rechaufee’d …… Our New Look Blog!